In advance of ‘Research Network: DREPM THE WOELD’ at the Stuart Hall Library, we caught up with participating artist duo Ming Lin and Alexandra Tatarsky. Tell us a bit about yourself, your background and areas of interest. We are writers, artists and researchers interested in the effects of the flows of capital that characterize and shape our world. In 2015, we began researching the phenomenon of those apparently nonsense Englishes that one finds written on T-shirts mostly coming out of China. Our backgrounds in anthropology, art history, performance, and translation feed into our ongoing inquiry of what we’re calling the Shanzhai Lyric, a distinct dialect born of relays between luxury branding rhetoric and the conditions of material production that evinces specific global hierarchies while revealing inherent flaws and artifice. We are interested in how this non-normative language use can challenge certain boundaries and definitions and wonder what its potential to redistribute hegemonic and aesthetic forms might be. With this work we hope to generate a framework for thinking more widely about ways that mimicry and rupture can be used as tactical responses to the exploitative inner logic of capital. This work comprises an arm of research being undertaken by Display Distribute, an itinerant research platform, documentary gesture, distribution service and sometimes shop in Kowloon, Hong Kong. Since 2015, we have been assembling an archive of shanzhai phrases and working to rearticulate them as poetry, essay, performance and curation. There’s a sort of unanimous fascination with this phenomenon, which we see as indicative of a larger curiosity about the origins of materials we unthinkingly interact with every day as well as the Western fetish for originality. The Shanzhai Lyric disrupts the incessant language of marketing, branding, selling, promoting and this unexpected encounter with distorted language creates a space to stumble over the familiar—to pause, reflect, and wonder in a way we don’t often have opportunity to do. Inscribed on garments that are often found materially lacking in opulence and luxury, the Shanzhai Lyric itself is in many instances, literally, shiny. This attribute draws attention to the surface-quality of surfaces, that is, how easily this shininess might crack and peel away to reveal something more complicated. Recently, we have been thinking about the Shanzhai Lyric as an illuminating strategy that parallels a wider orientation towards fragment, textural rupture, playful subversions of hierarchy, and the emancipatory possibilities of failure. Specifically, we are excited to position the discourse within a much longer tradition of Chinese landscape painting and calligraphy that values anti-mimetic emptiness, collective authorship, the materiality of text, and the art object as an ongoing and ever-changing site of creative process rather than a fixed, final product. Why did you apply for the Research Network? Why were you interested in the theme of Virtualities? Through exaggerated mimicry the Shanzhai Lyric punctures the veneer of luxury and the smooth transactions of capital. Its promise of unblemished happiness and optimism through consumerism affects a collision of the real and ideal. It ascribes to the aspirations of the fashion garment while audibly admitting the impossibility of actually attaining such fantasies by bringing the space of virtuality onto the body IRL. Surprising encounters between found words, ideas, images often result in a dense babel that reflects something of the experience of trying to communicate amidst information overload and the imperative to be generating capital at all times. Thus, the Shanzhai Lyric offers a humorous and poetic disregard for the norms of status-enforcing systems. In addition, shanzhai phrases could be viewed as a collaboration between human designers/poets/manufacturers and the virtual tools they employ through internet search engines, speech-generating apps, and translation programs. As such, it is a mode of production that invites collaboration between human and machine. What are you hoping this experience will bring to your practice? The Stuart Hall Library provides the ideal context for the elaboration of the Shanzhai Lyric, situating it within the discourse of post-colonial studies and literature. As part of this instantiation of our inquiry, we plan to thread this auto-poetic lyric through the various texts of the library, physically and conceptually weaving disparate ideas together with a clothing label that also functions as a bookmark. Some of the thinkers we have encountered on the shelves of the Stuart Hall Library that have been crucial to our thinking include Theresa Hak Kyung Cha, Édouard Glissant, Fred Moten, Coco Fusco and of course Stuart Hall. For instance, Hall speaks of bricolage as a way of negotiating class difference by adapting the materials of one’s environment in inventive ways that resist the use value of the original. This is a helpful frame for thinking through the activity of the Shanzhai Lyric and the garment as a site of ongoing ideological contestation. We hope that our time at Iniva will enable us to think further through the possibilities of de-territorializing the language of consumerism by reconstituting and reconfiguring the materials of fashion production. What would you like the audience to take away from this? A generative critique culled from the detritus of consumer culture. The possibility of humor and laughter as a mode of resistance. A consideration of the arbitrary nature of binary categories like self and other, global North versus South, and East versus West. A re-evaluation of the structures that encourage a cult of the individual. And finally, delight in nonsense—DREPM THE WOELD! Together Ming Lin and Alexandra Tatarsky investigate bootleg and copy culture, the poetics of mistranslation and nonstandard languages. 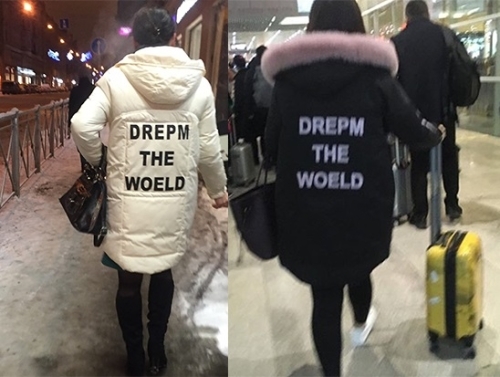 After undertaking fieldwork in the summer of 2015 to collect the ecstatic phrases found on T-shirts in Beijing, their conception of the Shanzhai Lyric was first elaborated in The New Inquiry as a way to think through otherness, commodity, failure and longing churned through global networks of fast fashion production. They have subsequently developed these ideas in publications and performance pieces in London, Detroit, and New York City. A forthcoming series of essays for ArtReview Asia will use the Shanzhai Lyric as a framework for looking at strategies that confront difference, hierarchy, and gaze in contemporary art practice.